Arthritis is a progressive disease, meaning that as it worsens, pain and loss of mobility can follow. Finding therapeutic solutions is a critical step in the process of slowing down this progression by increasing mobility and decreasing overall pain. Caron Chiropractic focuses on increasing a patient’s range of movement in the affected area so that more natural movement can take place. This natural movement promotes actually healing in the joint area. Experts say that early and aggressive treatment is most effective, but all’s not lost if your arthritis has yet to be treated. When our patients arrive at our clinic, the pain is sometimes overwhelming and hope for improvement may seem impossible. Our chiropractic treatments can provide significant and sometimes immediate relief without the use of drugs or surgery. Our team provides an integrated and multidisciplinary approach to your arthritis therapy needs. We believe chiropractic care is one important aspect of caring for arthritis symptoms, but we also incorporate physical therapy, massage and exercise for a complete treatment plan. If you or a loved one is battling arthritis and looking for non-surgical treatment options to decrease pain and increase mobility, give Caron Chiropractic a call at 1-651-255-9999 to schedule an appointment. We gladly accept most insurance and offer affordable rates and flexible payment options for those who are paying for their own care. 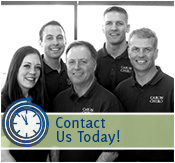 Our team is dedicated to helping you take the next step in your health journey. This entry was posted	on Sunday, November 22nd, 2015 at 5:55 pm	and is filed under Arthritis, Chiropractic, Chiropractic Treatments. You can follow any responses to this entry through the RSS 2.0 feed. You can leave a response, or trackback from your own site.